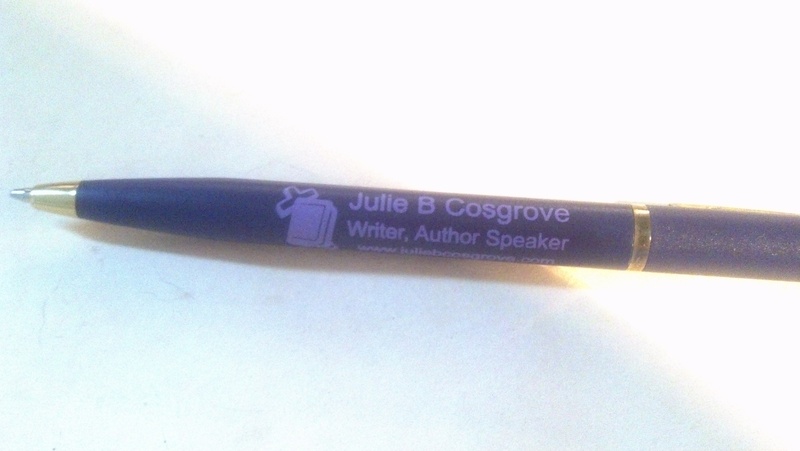 Since I lead workshops and retreats on my Bible studies and have vendor booths at churchwomen conferences to sell my books, my son suggested that I have my own pens. So I went online, found some that were not too expensive but not too cheap, designed the logo with my name and website, and then ordered 250. After about 6 months, I ordered 250 more. I was to attend a conference for an organization to which I belong called Toastmasters. It is a service organization which helps people develop speaking and leadership skills. It is also a very supportive, positive and affirmative group of folk. Though not a religious organization, there are many, many believers in the group who, like me, feel called by God to speak about His love and truth. But I digress . . .
That little voice I have learned not to ignore told me to donate 200 pens for the “goodie bags” everyone would receive. That was the exact number I had left from my second order – surprise , surprise – so of course I had to order more for my upcoming events. It was an expense I was not budgeting for at the time. But, I donated the pens anyway. Guess how many people came? If you said 200, you’d be wrong. It was actually 203. I had exactly three more in my purse. Here is the thing. I do not know if those pens will have any impact at all. I do not know if one person in those 203 will buy my books or visit my website, or book me to come speak. 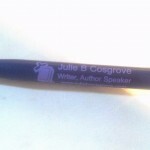 The pen may sit in their bag for months, get tossed into the bottom of a purse or drawer, or be left somewhere. That is not in my hands. But, I did as I was told by my heavenly P.R. agent and tried not to question why. “Do as you are told. The rest is up to Me,” the voice inside yet not from me whispered into my soul. “Yes, sir,” I whispered back. That made me realize the same is true when I tell someone about His love and sacrifice. It is not up to us to manipulate the reception of the message, just to give it away – to donate it. God is in charge of how it is received. We may think it lands on deaf ears. We wonder if we have any impact on the lives to whom we teach, serve or preach. Like those wiggly kids in Sunday school whose attentions seem to be more on the graham crackers than the Bible passage, or the pre-teens who just stare at the ceiling and yawn. Or, the homeless person we give a bottle of water and a smile to on a sweltering day. Or, the old man with only a carton of milk and a loaf of bread we let in front of us at the grocery store even if we are running late, then wait patiently as his shaky hand writes out the check in slow-mo. How about the friend who tell us their umpteenth woe story of the week, yet refuses to let us pray with them? Little seeds planted upon the road of our lives, just like in the parable in the Gospel of Matthew (13:3-9 and 19-23). That type of planting is called broadcasting- you broadly cast them across the earth, hoping a few will actually take root and grow. It is not a coincidence radio and TV “broadcast” over the airwaves without knowing who will listen in. In the same way, our job is to scatter the message of Christ – God will handle where it falls and what happens after that. What is your seed? Is it a pen, a business card, or an email? Is it a Christian saying you share on Facebook instead of what your kid did today? Or is it the cross around your neck and the smile on your face? Are you a teacher or a musician? Are you the mom whose home is the neighborhood hang out? Are you the one at work on whom everyone depends? Are you the prayer warrior to whom everyone comes with their problems? Little seeds – Scatter His love. Sow his Truth. Broadcast His Word. Let them fall where they may. Just keep scattering.